The Ceramic Clocks combine geometric and organic shapes in a way that is both playful and sculptural, evoking associations with three-dimensional works by artists like Constantin Brancusi or Isamu Noguchi. For unknown reasons, the Ceramic Clocks were never produced in series, though designed and developed in full detail in the early 1950s. 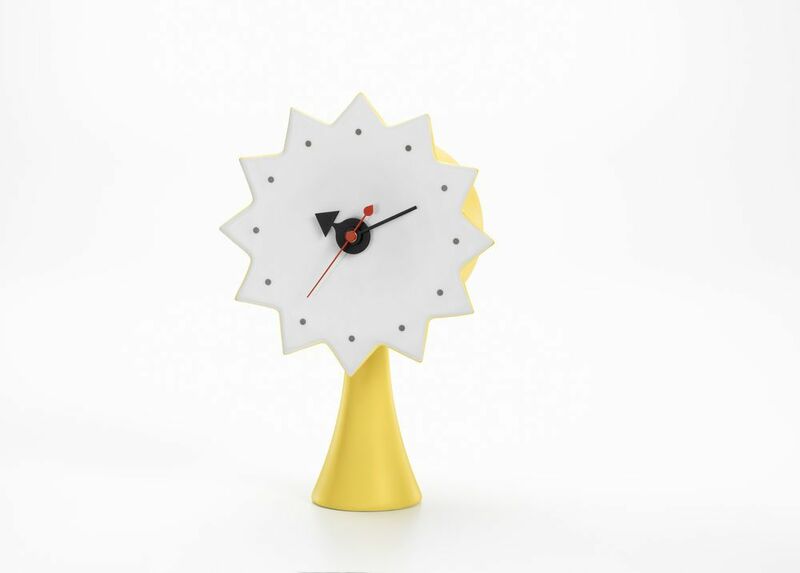 On the basis of the original plans and prototypes, Vitra has produced a new edition of the Ceramic Clocks in porcelain, finished in a variety of coloured glazes and equipped with a modern quartz movement. These cheerful table clocks are available in three versions. Product contents: high-quality quartz clock movement, 1.5 volt battery included. George Nelson, born 1908 in Hartford, Connecticut (USA), studied architecture at Yale University. A fellowship enabled him to study at the American Academy in Rome from 1932 to 1934. In Europe, he became acquainted with the major architectural works and leading protagonists of modernism.